Do your knives also go into the dishwasher, or are they an exception to the "no handwashing" rule? I have one 9 1/2" chef's knife that I hand-wash. I only use it for veggie prep. All other knives go into the dishwasher. My machine has a 6 comparment cutlery tray built into the door. I only put one knife in each of the 3 sections I use for knives so that they don't bang against each other. My other 9 1/2" chef's knife, which I have had for 30 years, does go in the dishwasher. The two 9 1/2" are from the same maker, long out of business. I sharpen all of my knives on my EdgePro and have never had issues with the dishwasher affecting them. I spent 16 years in the corrosion monitoring industry so I have some insight as to what could happen. Corrosion monitoring, eh? You're the perfect person to ask, then: is it just the knives' being banged around that's hard on them? I'd gotten the idea that the dishwasher detergent could pit them. Does the type of detergent and the water chemistry change the answer? Feel free to PM me if the answer is too long - but I bet there are a lot of others here who would also be interested. Banging around is hard on any knife. With other dishwashers we have owned I put my knives in the top rack to avoid that. This model negates that need. I have used Cascade detergent only forever. If there was going to be pitting, of which common wisdom seems to be the the thing to be feared, I would have seen pitting by now. Since I only use the one brand I can not speak as to what could happen using other detergents. I also use a heated drying cycle so the surface moisture is removed at the end of the cleaning cycle. FYI: I was in the electronics end of the business but you can't be immersed in it without learning the basics of the various corrosion mechanisms. Two of my hunting partners made their living on the chemistry end of corrosion so I was also exposed to many conversations about real-world effects. Edited to add: I only own stainless steel knives. Making the pierogi is women's work at the church, although the cooking on the day of the festival is strictly men's work. Another thing that's strictly men's work is coring the cabbages for the golabki, with an electric drill and large bit! I think the first year I helped was the first time I'd ever seen a power tool repurposed for kitchen work. Smithy, you have a nice array of international cuisine sections in your supermarket. Is the population as diverse? I love the idea of using power tools to deal with kitchen chores. As I recall, you use a lathe to peel winter squash, do you not? I think of Duluth's population as still being pretty homogenous: European ancestry, for the most part: Scandinavian, Germanic, Slavic, British Isles, based on the faces I see in the grocery store. However, the populations of the university and colleges here are quite mixed, as are the staff of the medical facilities: with 2 major hospital chains and I-don't-know-how many clinics, the medical practice accounts for a lot of employment around here. Unfortunately the demand for international cuisine hasn't been enough to keep any sort of specialty store afloat, except for a couple of Italian groceries that have been around here forever. (Italian immigrants were a major wave early in the last century.) The Oriental grocery died several years ago, I believe a victim of the general economic slump that hit us all around 2008. There's never been a good Middle Eastern or Indian grocery store here. I'm glad that Cub and Mt. Royal, my other favorite large grocery store here (still to be visited this week) are meeting the demand. I do, in fact, use a lathe to peel butternut squash, my favorite of the winter squashes. HUGE time-saver, if I'm doing more than one squash, but not so good on the ridged varieties like acorns. My corner of upstate NY is also pretty homogenous. I wouldn't be surprised if, around here, a mixed marriage consisted of someone from a family attending St. Stephen's, the Polish Catholic church, wedding someone from a family attending St. Mary's, the Italian Catholic church. (To say nothing of the other two Catholic churches still in town, or the three that have been closed since before we moved here. But, like Duluth but on a smaller scale, we also have a university and a hospital, which help a little. We had a Filipino grocer for a brief moment, started by one of the doctors who was Filipino, but she passed away suddenly and the store subsequently closed. If we can't find what we're looking for at the one big supermarket left in town (I'm looking at you, hot salsa! ), we need to go to either Syracuse (an hour away) or Rochester (an hour and a half) for an Oriental, Indian, or Middle Eastern grocer. How far would you have to drive? Is it close enough that you're willing to do so, or do you resort to mail order or just go without? Melissa, making your own salsa is quick, easy, tasty and it's possible to clear the house of unwanted company, depending on the peppers you use! %) PM me if you'd like recipes, my late hubby used to make it, but because I have a tender mouth, I don't eat it. Garrison Keillor often makes jokes like that about a "mixed marriage" in Lake Wobegon being between Lutherans and Catholics. As far as I know, I'd have to drive to the Twin Cities (Minneapolis/St. Paul) to find a Middle Eastern, Oriental, Mexican or Indian grocery store. That's around 3 hours from here, so I resort to mail order or else stocking up when I'm passing by a convenient store. Woe is me, my favorite mail-order place seems to have folded. Flavor of the Med (Flavorofmed.com) is the only source I've found for Greenland feta cheese, an Egyptian creamy feta packed in tetrapcks. Alas, their web site is down and they aren't answering my calls or emails. (If anyone reading this knows of another source, please PM me.) I may have to do without that cheese. 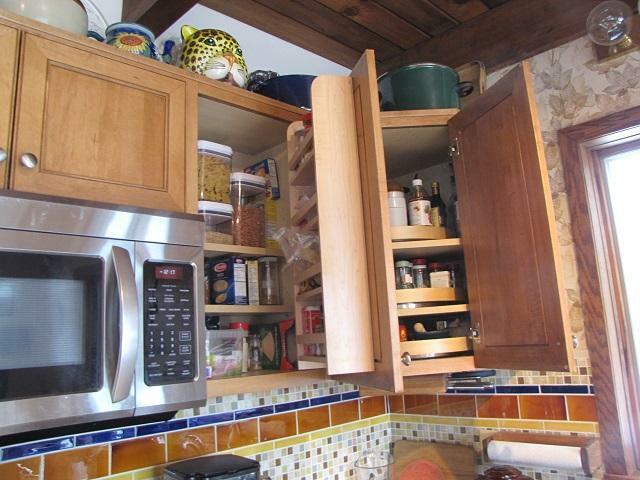 One of the things we did when we remodeled the kitchen was solve some thorny storage problems, Corner storage is always an issue: our old cabinets had a blind corner with an open space, out of sight, between the end of one set of shelves and the under-sink storage. The cats loved it. I found a food mill that the previous owners had probably long since lost. One of my priorities was to use that space better. Ta-Da! Turntables in the corners! The lower corner has larger-radius turntables with a corner cutout. I didn't bother attaching a photo, but I'll show it if someone asks. We also made good use of pullout storage. The waste baskets (3: 1 for trash, 1 for paper recycling, and 1 for other recyclables) sit in one pullout rack. Many cutting boards and baking sheets, as well as those countertop drain pads, occupy another. 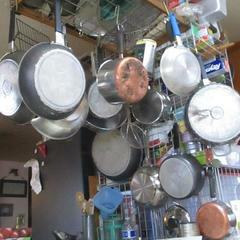 The pots and pans, and small electric appliances, are on rollout shelves. I love being able to roll out a whole shelf and grab what I want, instead of having to dig to the back of a cabinet. Tonight we're having friends over for dinner and a movie, so the meal plan involves a lot of finger food and the fixings for sandwiches. I generally make bread by hand these days, but on days like this when we're trying to thaw frozen water pipes (!) it's nice to just throw stuff into the machine. 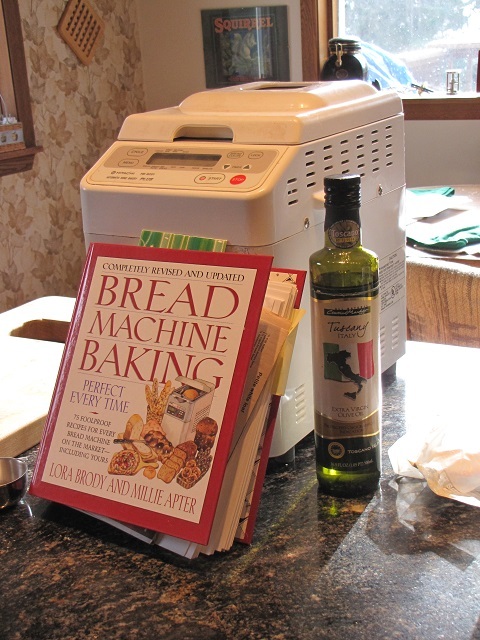 This bread machine cookbook is still one of my favorites. In the machine are the makings of "Rita Fried's Garlic Herb Bread". 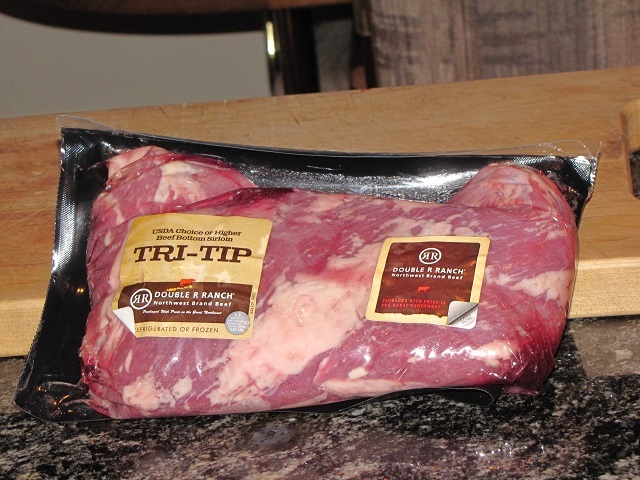 My Old World Meats tri-tip is waiting to begin cooking. I'll be trying out a protocol set out by America's Test Kitchen in an edX course on the Science of Food and Cooking: sear quickly, then cook very very low and slow. At times like this I wonder if sous vide is in my future. Here it is, in its original package. I was a bit surprised to get it home and find they hadn't cut it themselves, but I think demand must have risen enough that they order it specially.
"" 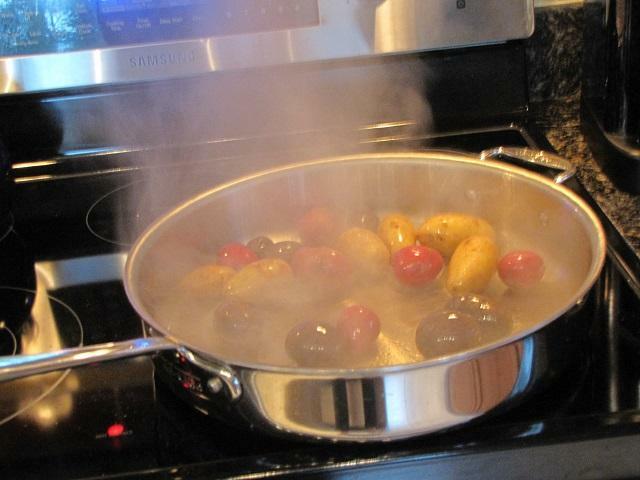 sous vide is in my future ""
its well worth looking into, esp. if you have a freezer and get periodic sales of meat(s) you would normally buy. ps the Anova is the game changer here, making it much easier to get a 'set-up' w min fuss. Thanks for that, rotuts. I've been following the topic about the reviews. Very interesting! Smithy, we have the same set up in our corner cabinet: large lazy susans in the lower cabinet and smaller lazy susans in the upper cabinet. I keep my spices in the upper cupboard (I have them alphabetized because I'm like that). I wish we had pull-out storage. Is that a Kohler faucet? It looks like mine, but I have a different sink made of a compound of some kind and extra deep. We got rid of our old porcelain sink when we did the granite countertops. Great blog! I love your well behaved cats, too. best investment one can make 3 " or more. If it's not too much trouble, I would like to see a picture of this. We are moving into a condo next week that has three of these corner cupboards and i'm trying to find out what would make the contents more accessible. PS I also like the pictures of your kitties. Enjoying you blogg so far. Thanks. 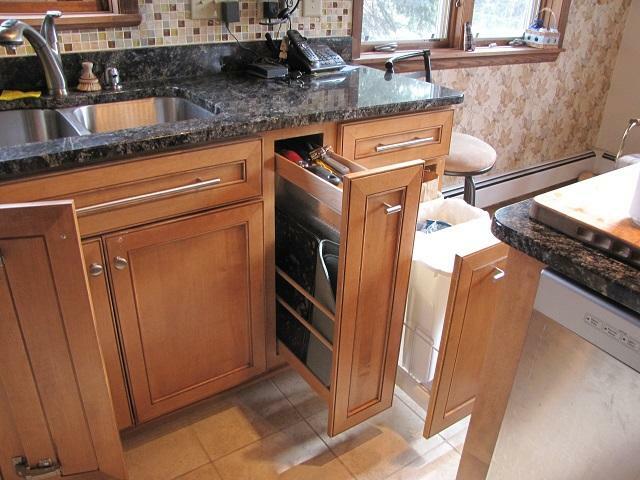 I like the center island in your kitchen. It has plenty of electric outlets. Good planning. Beautiful kitchen Nancy.....MUCH nicer than what I have to work with. I wish I had been smart like you. I NEEEEEEED those lazy susans in my cabinets. Wow, thanks for all the comments and compliments! I'll follow up on them tomorrow...technically, later today now...and include photos. Our dinner spread tonight, as previously noted, was a lot of hors d'oeuvres (I had to look that up twice, no wonder we say "appetizers") as well as the tri-tip, potatoes and bread. Good conversation, good wine and beer, and a movie ensued. I neglected to mention earlier that we picked up smoked salmon at Old World Meats in addition to the tri-tip. Clockwise, from the warming tray on the table, we had crackers and olives, several cheeses, garlic-cheese bread from the machine, smoked salmon and cream cheese, veggies with roasted red pepper hummus, and an artichoke dip on a tray with spare eating utensils. 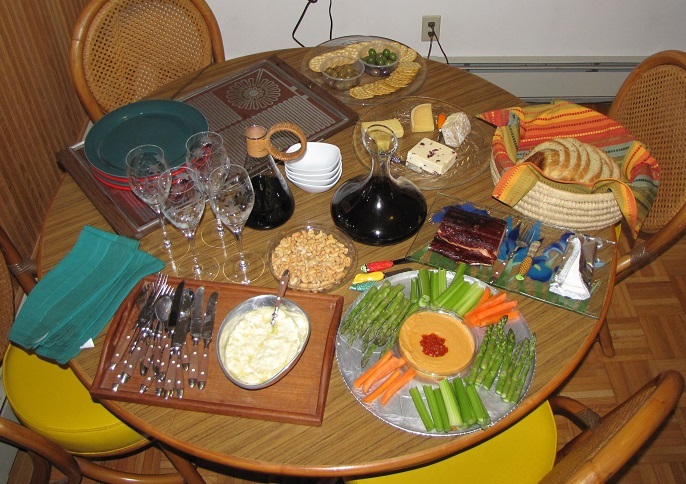 In the center are cashews, wine glasses, and the wines. 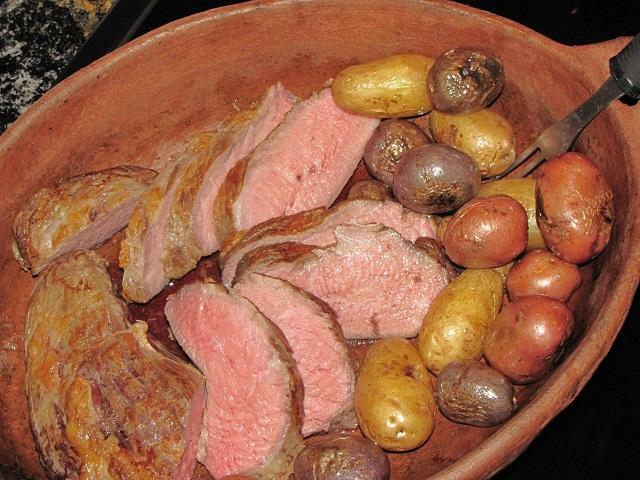 The tri-tip and potatoes landed on the warming tray after that photo was taken. Today's tri-tip adventure was well worth repeating: the meat was tender, flavorful, juicy and rare to medium rare through much of its cross-section. 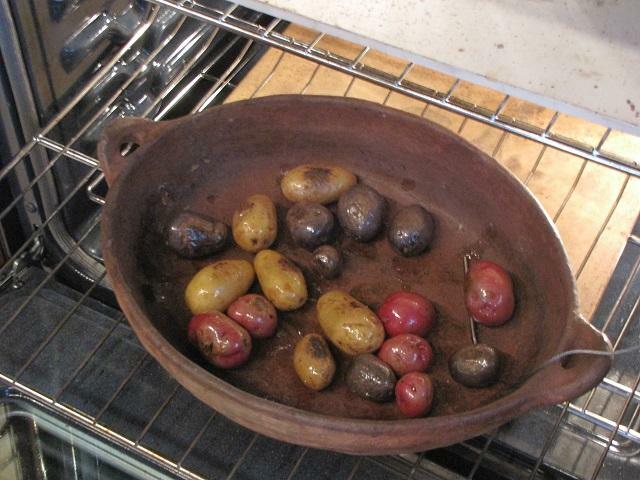 Adding potatoes didn't hurt, either. I'm pretty sure the faucet is a Delta, but now I'm left trying to decipher a logo without words. I looked at Kohler and at several other manufacturers. This one got my vote, at least in part, because it could spray or stream and would stay in the position I'd last selected. Most faucets I looked at always started in the default mode (usually "stream"). I wanted a faucet that would stay in the selected mode as I cycled the water off and back on. I also wanted, and got, a faucet with an attached hose so I can pull the unit out to clean and spray the sink. That hose is a GREAT feature. I have a good friend who alphabetizes her spices. We aren't that organized, and it would backfire if we tried due to my darling's extremely creative spelling. Trying to categorize herbs or spices according to cuisine is marginally better, but things tend to migrate anyway. If its in a carafe you have to drink it all.
"" you have to drink it all """
Oh, I know, and we do so when we can get decent tomatoes and decent peppers. But there are times when opening a jar is a lot easier and better, or times when we're feeding the masses. And then it becomes annoying to find only wimpy salsa on the store shelves. Is that a 50s coffee server repurposed as a wine carafe? Very yummy inviting looking spread. I'll be over directly. Your kitchen does indeed look nice and well-planned. I also like the outlets along the island edge. And the cats. I love cats. I hope yours work their way into a few more pics! You had frozen pipes? Hope that was resolved OK.